As Gabon’s election campaign approaches its end and President Omar Bongo looks set to cruise to victory, only fraud allegations and voter apathy still have the potential to rain on his parade, according to analysts. After 38 years in power, Bongo is the longest-serving current head of state in Africa. But although he faces four opposition candidates, a sixth term, made possible by a 2003 constitutional amendment, is a virtual certainty. Despite numerous billboards with messages like ‘I’m a secretary and I’m voting!’ and calls from candidates urging people to take part in the Central African country’s third multi-party elections, the numbers reveal a lack of enthusiasm among the general population. In the oil centre of Port Gentil, for example, under half of registered voters have gone to the trouble of getting their election card, according to a Gabonese news agency. However, this apathy is not due to a lack of effort on Bongo’s part, according to Philippe Ndong of the University of Libreville. In September, even before an election date was set, Bongo announced that he was making public schooling free. Three weeks later, he offered a month’s worth of free water and electricity to 100,000 households. And during the campaign, cash has regularly been handed out to supporters at political rallies. “The regime is so disconnected from the people that the only way it can communicate is by handing out financial perks,” said Anacle. 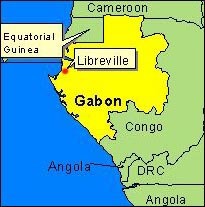 By African standards, Gabon is a rich country, with a per capita GDP that is three and a half times higher than the sub-Saharan average thanks to a small population and revenues from natural resources that include oil, gold and manganese ore. But the country’s coffers are not bottomless. In addition to allegations of shady campaign tactics, there are concerns about how legitimate the actual voting process will be. “Since 1990, every election result has been contested because of skewed mechanisms and this year again, there is no transparency,” said the sociologist Anacle. Bongo claimed victory in the 1998 elections with two thirds of the votes but opponent, Pierre Mamboundou who is running again this year, denounced the official results and said that he had in fact won the contest. “It would be best to break with the habit of claiming a percentage of the votes before the counting is done and then doling out the remainder to the other candidates as you see fit,” wrote Zachary Myboto, a former minister in the Bongo government who is now running against his old boss, in a letter to the president earlier this month. Last month, the president made a concession to the opposition by granting them 40 out of 120 spots on the electoral commission which the ruling party had controlled completely in the past. But there are concerns that holding the voting over two days - Friday for the security forces and Sunday for the rest of the population - opens the way for fraud as the number of those eligible to vote on the first day has not been made public. And the fact that there are three official national population figures, ranging from 1.2 million to 1.5 million, further muddies the picture. After nearly forty years of Bongo rule and the looming prospect of another seven, many voters see these elections as more of an exercise in public relations than democracy. “Me, I think I just won’t bother voting,” said professor Ndong.